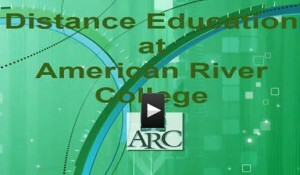 American River College, as a premier learning community, provides distance education that serves our students in a manner that is consistent with the college’s overall vision to transform and enrich the lives of our students. Review the “Is your course Accreditation-ready?” prior to completing the Checklist above. ARC Distance Education Plan 2019–Coming Soon! ARC Distance Education: A comprehensive series of reports that examines demography and compare enrollments and student success for online and face-to-face classrooms over five years.